For PTP/NYC (Potomac Theatre Project)’s 29th season they have chosen to pair one-acts by two of their favorite playwrights, Howard Barker and Caryl Churchill, who are also among Britain’s leading dramatic authors but who are not seen here as much as they ought to be. At first glance, the two plays could not be more different, but on closer examination they deal with similar themes, particularly as both have strong historical women as their central characters, and offer modern sensibilities on ancient themes. As an addition to the more familiar work of these acclaimed contemporary writers, this makes a fascinating evening for those who follow British drama. The curtain raiser, Howard Barker’s 1982 “Judith: A Parting from the Body,” is a New York premiere of this 33-year-old one act. It is a modern retelling of the Biblical story of the beautiful Jewish widow Judith who went to the tent of the Assyrian general Holofernes the night before a battle that would have destroyed Israel and in making love to him managed to behead him and save her people. The longer and more substantial of the two plays, Churchill’s 1976 “Vinegar Tom,” recreates the 17th century hysteria around the fear of female witches, while using the Brechtian device of original songs to comment on the action, similar to the way the musical Spring Awakening handled its two time frames. 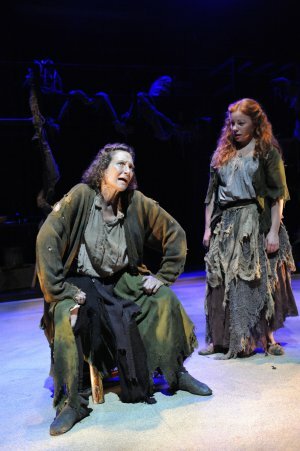 While both plays tend to be preachy in their presentation, “Vinegar Tom” is the more successful of the two plays in the staging by co-artistic director Cheryl Faraone. Barker’s plays are often intellectual debates on serious subjects. “Judith” presents three Biblical characters, Judith, her maid, and the Assyrian general, but Barker’s purpose is quite different from the ancient telling. Although the events are the same (although Barker’s Holofernes doesn’t drink so that Judith cannot get him drunk), here the characters discourse and philosophize on love, death and power, often in monologues which are quite deep. Holofernes muses on the inevitable deaths that will occur on the following day while Judith thinks about her goal of seducing the enemy general with whom she eventually falls in love. Costumed by Mira Veikley in contemporary clothing and with modern chrome and glass furniture in Hallie Zieselman’s scenic design, co-artistic director Richard Romagnoli appears to want us to see the play in the light of modern times. While the cast of Pamela J. Gray as Judith, Alex Draper as the general, and Patricia Buckley as Judith’s witty servant give fine performances, they are somewhat overcome by the talky, didactic nature of the play which does not give up its secrets on a first hearing. Presented briefly in New York in 1992 for ten performances, Churchill’s “Vinegar Tom”‘s 17th century story (which also has a feminist point of view) is here authentically costumed in historical style by Annie Ulrich. However, the chorus of three accomplished women singers (Caitlin Rose Duffy, Joelle Mendoza and Liana Barron), who remain outside of the action but comment on it in six songs set to Churchill’s lyrics by Carol Christensen, are dressed in contemporary garb. In the program notes by Churchill, the author explains that for this commission she wanted to write a play about the causes of witch-hunting as “poverty, humiliation and prejudice,” unlike Arthur Miller’s similar The Crucible, whose theme was political. 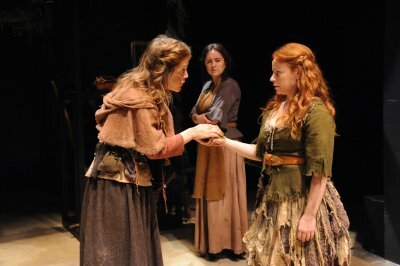 Told in 21 swift scenes in addition to the six musical numbers, “Vinegar Tom” tells the story of four women in a small village in the north of England who are eventually accused of witchcraft by their neighbors. Alice (Tara Giordano) is too free a spirit for her neighbors and her nighttime wanderings lead them to believe that she is very promiscuous and sinful. Her mother Joan (Nesba Crenshaw) unfortunately curses her neighbors when they won’t relieve her hunger and they remember it bitterly when their cows become sick. Ellen (Lucy Faust) is sought out for her advice with herbs in good times but then thought of as evil in bad times. Susan (Chelsea Melone), Alice’s friend and neighbor, who has too many children already, seeks out the help of Ellen to get rid of her latest pregnancy and lives to regret her action. It is the greed and fear of neighbors Margery (Kathleen Wise) and Jack (Bill Army) that fan the flames of the cries of witchcraft, while the hypocritical Packer (Steven Dykes) and his assistant Goody (Ms. Buckley in a second performance) stand to gain a good deal of money in their discovering and ridding the community of the supposedly corrupted women. Faraone has obtained trenchant and caustic performances from her large cast of 11 playing 15 roles. Most notable are Giordano as the unconventional Alice who assumes the same freedoms for women that men have always taken as their birthright and Crenshaw as the slightly touched Joan whose poverty may have helped to addle her wits. While the six songs pointedly performed by the musical trio make the contemporary audience complicit in the events, it is the final scene that has the most punch. Faust and Crenshaw reappear as a kind of vaudeville team, Sprenger and Kramer, two professors of theology, the authors of the 1486 treatise Malleus Maleficarum (Latin for The Hammer of Witches). Written to challenge all arguments against the existence of witchcraft, the passages spoken by them are a devastating diatribe against women and go far to explaining the virulence of the witch hunters. Vinegar Tom (which refers to Joan’s wandering cat) packs quite a punch even though it doesn’t tell us much we haven’t heard before. PTP/NYC, which has championed Barker in all of its seasons and is now presenting its fourth Churchill play, is fulfilling a service to offer challenging and difficult British plays, often in their American premieres. While many theatergoers may find Barker’s “Judith” heavy going, the production is balanced by the lively revival of Churchill’s “Vinegar Tom” with its raw language and contemporary songs. This is an evening for fans of both Barker and Churchill, as well as those who like plays of substance, particularly from British authors. A quietly delightful portrait of a clash of cultures—with music.